Tuesday, July 17, 1888 Rather warmer, & more pleasant. All appear as well with our folks, & think spending day much as usual, tho' Ellery took his supper at a "Nite Society" of some Temperance society, & out late in evening. 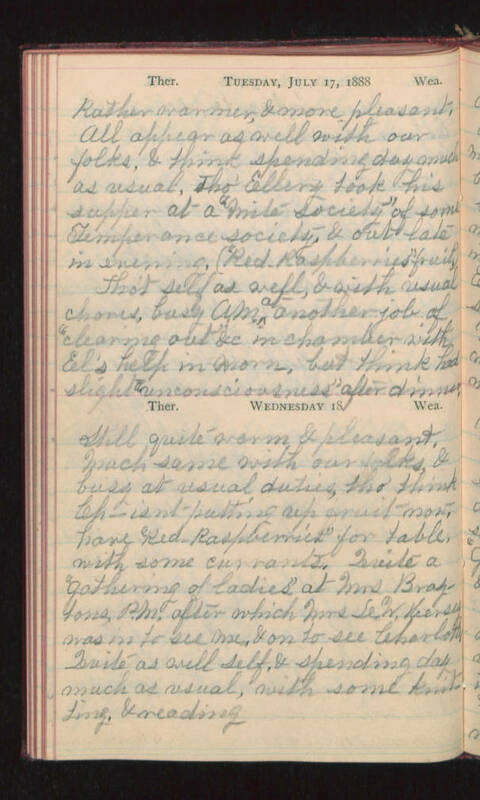 ("Red Raspberries" fruit) Tho't self as well, & with usual chores, busy A.M. at another job of "cleaning out" &c in chamber with El's help in morn, but think had slight "unconsciousness" after dinner. Wednesday 18 Still quite warm & pleasant. Much same with our folks, & busy at usual duties, tho' think Ch- isn't putting up fruit now, have "Red Raspberries" for table, with some currants. Quite a "gathering of ladies" at Mrs. Braytons, P.M. after which Mrs L. W. Kersey was in to see me, & on to see Charlotte. Quite as well self, & spending day much as usual, with some knitting & reading.